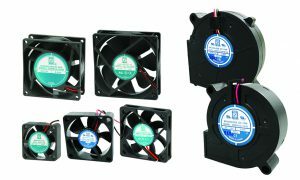 Orion Fans has expanded its DC fan and blower product listing to offer a viable, long-term source for customers when they face End-of-Life or product discontinuation notices. Orion Fans has introduced 52 new DC fans and 4 new DC blowers. The additions to the DC fan and blower families include a wide range of package size, speed (RPM), airflow (CFM), and special function combinations. Learn more at www.orionfans.com.